The harbour is a story of it’s own, baking in harsh sunlight, encircling an emerald oval of water, it’s a lonely industrial space littered with signs of a financial crisis and a migration surge. 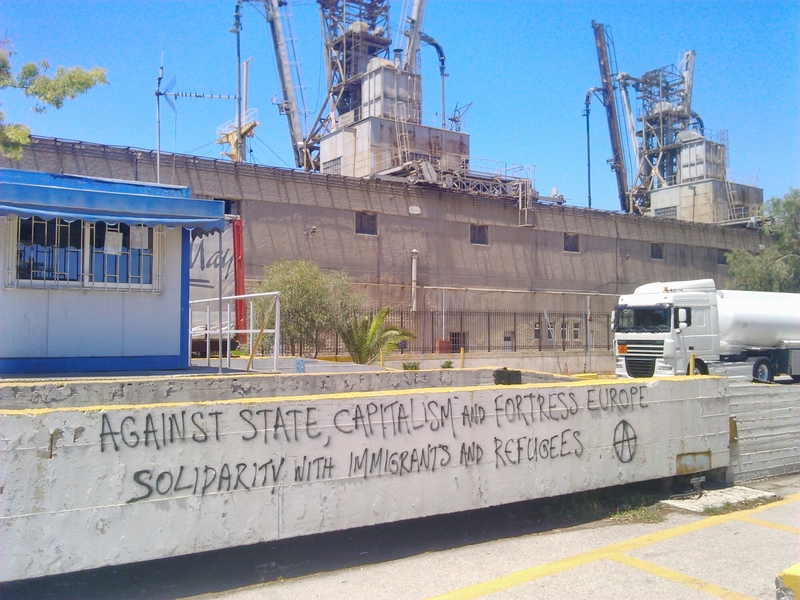 Graffitti demanding an end to boarders, anarchist A’s and communist hammer-and-sickles. And a sinking ship. What in the world is this doing here besides peeling, like a tourist fallen asleep in the sand? I found a police officer nodding off in the shade. We were the only two people out there, but he pretended not to see me as I approached. I inquired about the listing vessel, and he answered in broken English. Ah, okay. Why? Do you know? At the other end of the bay I began to see people other than Greek police or the odd tourist deboarding a ferry with a rolling suitcase and a sunscreen gleam. I saw a few tents, then a lot of tents. I passed a blockade of tired cops posted out under an umbrella and I wandered around a bit suspiciously before running into two young American women with deep tans, looking like volunteers. They were both from Montana. As Keegan ran to the road to fight off a camera crew who had literally just pulled up in a car and begun to start filming through the window, Johanna took me into the warehouse to “talk to someone who can answer your questions better.” We passed kids playing with flipflops and rubber gloves, women snapping photos inside a communal tent, young guys waiting in line to shower. Johanna greeted almost everyone by name. Inside the warehouse was hotter than outside. About 35 degrees, according to one thermometer. But in here you can’t get burned. Several volunteers and residents were sitting around a table, smoking, drinking and eating cheap cookies, in the low light, surrounded by boxes, crates of waterbottles. A young Syrian man came in and lit up a cigarette, slunk down in an arm chair at the far end of the coffe table and blew smoke rings at the high, high ceiling. After some introductions and a bout of required abraisive humor (“Are you just one of those bloggers who takes photos of refugee kids and then leaves”), they started to tell the story of the place. About 1,100 people live here, slightly more from Afghanistan than from Syria. The owner of the warehouse donated the space to an amalgam of humanitarian groups, and he acts as the responsible, the liason between the Greek authorities and the aid workers. A Norwegian organization called A Drop in the Ocean runs most of the facilities like the showers and toilets. The Red Cross has a truck posted outside, but according to the volunteers I talked to, they are as aloof as Switzerland — they don’t get involved. Keegan has driven people to the hospital, dressed wounds by herself. That kind of thing. The Greek Navy supplies the bulk of the food. A British group called KODRE (I’ll confirm this name soon) supplements the “godawful” ration grub with hot sandwiches and wraps that they make every night with the help of donations. For a while, the government didn’t get involved. But because it’s one of the largest unofficial refugee camps left (police cleared the well-known camp at Idomeni near the Macedonian boarder which sent many people back south to Athens), now the government is hassling the people at the warehouse here. About a week ago, supposedly, a warship docked and threatened to clear the camp. But in the end they did nothing. 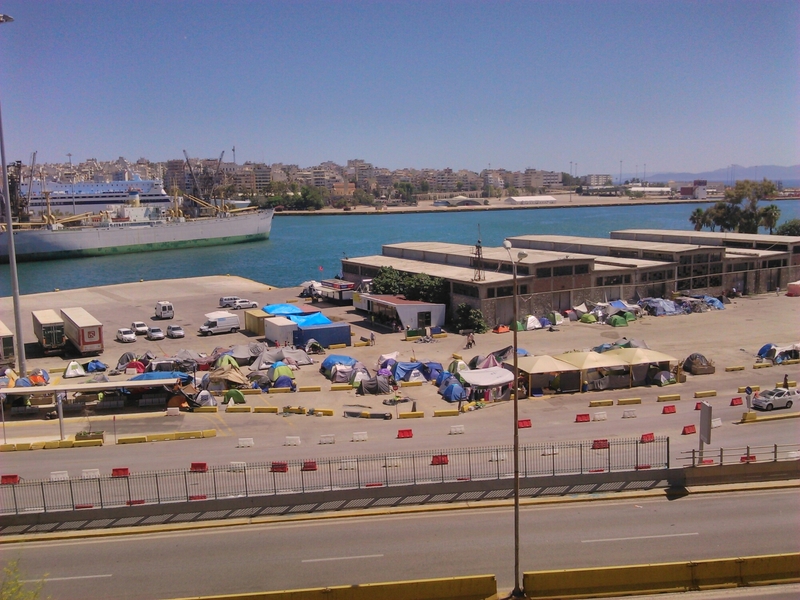 The government’s aim is to move refugees into official military camps, but the people who have stayed at the harbour want to stay there, according to the volunteers. They want to stay because, says Michael (who’s with Drop in the Ocean), “It’s chill here. We get along with the people, they get along with us.” Which is more significant than it sounds. At 4 p.m. I walk with Michael to the “kitchen” — the place where they make the wraps. It’s still blistering hot out and I realize I’m burning a deep red, even through my T-shirt. 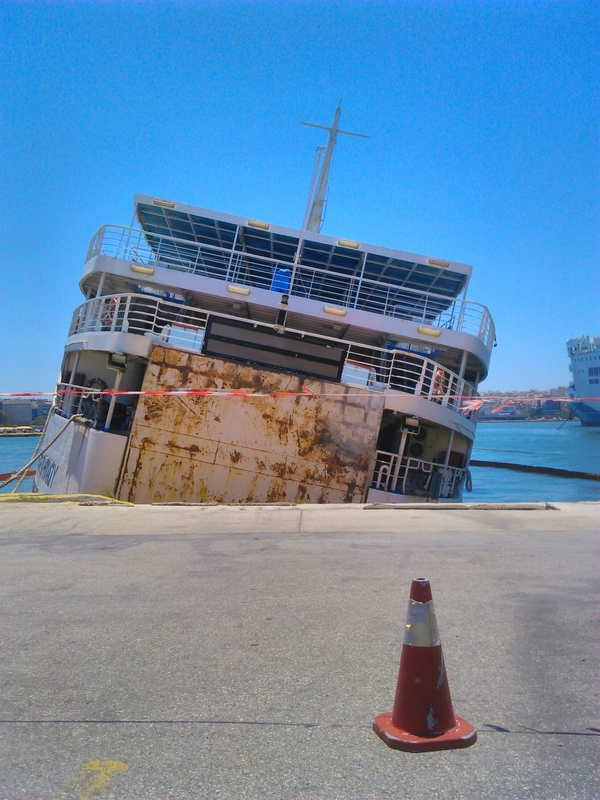 It turns out to be a long walk because we have to go into the port-town of Piraeus. I ask him if he has any sunscreen. And on the roof of an empty restaurant I found an international crowd ready to make 1,500 wraps before dinner time. I met two Germans, a Czech woman, a British dude, a guy from Syria who showed me photos on his phone (at the beckoning of one of the Germans) of him holding an assault rifle, wearing an Iraqi Army uniform. He had fought against ISIS in Iraq. 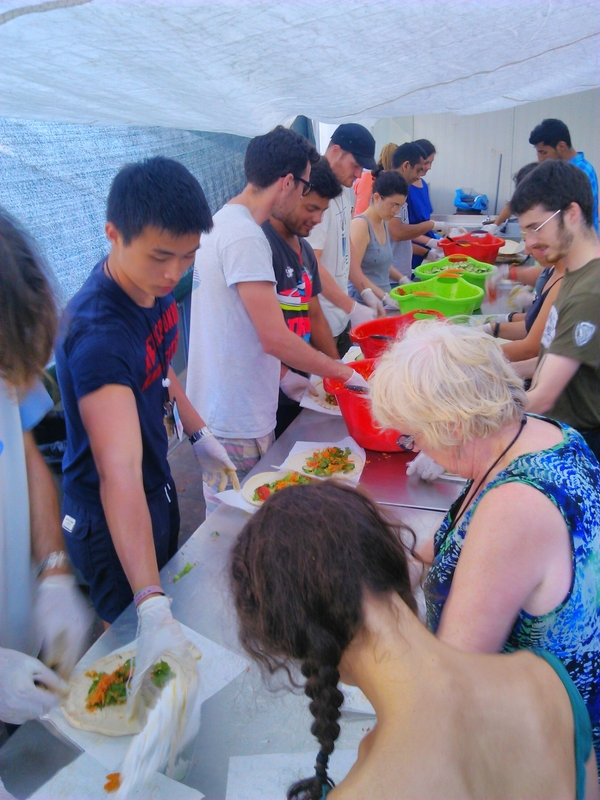 Now he was making vegan wraps for the people living in limbo at the port. I’ve been invited back tomorrow, so more on this group to come.